France on Monday accepted a first group of 19 refugees identified in Africa under an overhauled asylum policy that will also see it expel thousands of economic migrants. 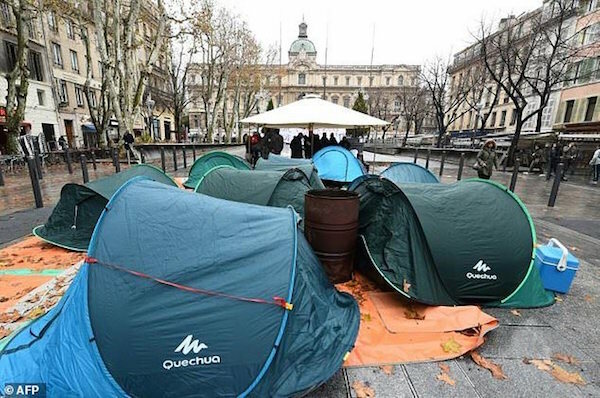 While it has drawn little public outcry in France, the policy faces stiff opposition from the left and from charities that shelter migrants, 22 of which called in an open letter for France’s rights ombudsman Jacques Toubon to intervene. The new refugees — also hailing from war-torn Sudan — were brought to France from the camp in the Chadian capital N’Djamena where Djamel said around 1,000 people were sheltering. The programme, which expects to identify 3,000 African refugees by 2019, aims to prevent people from risking their lives at sea. More than 3,000 have died attempting to cross the Mediterranean in rickety boats since Europe’s migrant crisis started in 2015, according to the International Organization for Migration. Macron said last month that while he was “deeply committed” to France’s “tradition of welcome”, his government would be “inflexible” in its policy of expelling those who do not qualify for asylum. The president acknowledged that the operation was at the mercy of “geo-political shifts” in the Middle East and migration caused by crises linked to global warming. His so-called “migration hotspots” in Chad and Niger process the asylum applications of people already recognised as refugees by the UN refugee agency UNHCR. Both are former French colonies in the semi-desert Sahel region of Africa. The French government has launched a parallel programme in France to distinguish between asylum seekers and those in search of a better life in Europe. The centrist Macron — whose staunchly anti-immigration rival for the presidency, far-right leader Marine Le Pen, won one third of the vote in May — has touted a tough policy towards economic migrants. He drew praise from Le Pen’s National Front party, which on Monday claimed a “political victory” in the government’s focus on “the major problem of immigration”. He noted that most of those sheltering in centres in France came through another European country, which has the legal responsibility to determine their asylum status under the so-called Dublin Regulation. “If the centres become traps for migrants, some charities will shut down their operations, and the migrants themselves won’t go to them anymore,” Gueguen said. Rights ombudsman Toubon, speaking on France Inter television, said the programme could incite unrest at the shelters, pitting those with a realistic chance of asylum against economic migrants. The number of those expelled from France rose by 14 percent in the first 11 months of the year, Interior Minister Gerard Collomb said Monday. Of some 85,000 requests for asylum in France, 36,000 were granted in 2016. The polls left long-serving Chancellor Angela Merkel without a majority and struggling to forge a coalition as the far right surged on anger over her migrant and refugee policy. “France is a generous country, but it cannot take on all of the world’s misery,” Macron said last month. He was echoing the words of his Socialist mentor Michel Rocard, who was prime minister from 1988 to 1991, and the first left-wing leader openly to suggest curbs on immigration.